Maple Leaf Scarf – Crochet Today! This Maple Leaf Scarf is another one of my designs in the Sept./Oct. issue of Crochet Today! I designed this scarf to look like so many trees in New England do in the fall. Rarely are they all one color – Some of the most breathtaking trees are the ones that are full of many colors – green, yellow, orange, rust, bright red, deep red, burgundy. My crochet designer friend, Amanda Saladin, designed this Dartmouth Pullover that makes a great backdrop for the scarf. 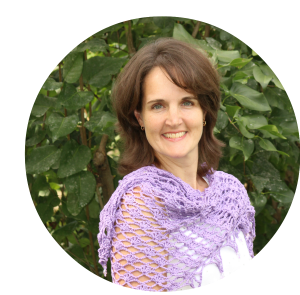 Amanda designs many beautiful sweaters for Crochet Today! and other magazines (even some knit magazines!). You can see more of her work on her Ravelry page here and on her website: www.designingcrochet.com. Last Minute Hostess and Kid Gifts! ← Kerry Shrug – Prize-winner! Enjoy this blog? Subscribe to see more!